Within days after dates for Gujarat elections have been declared , terror elements in Gujarat started their terror agenda to incite riots once again in Gujarat. A Rally to condemn so called Anti Islam movie produced by someone somewhere in the world was the reason for Hundreds of Jihadis to pour into the streets of Ahemedabad. A City wide bandh was called on Wednesday by a woman Zarinakhan Pathan. The bandh call were rejected by Muslim leaders and organisations. Mufti Shabbir Ahmed of Jama Masjid, members of organizations like Jamat-e-Islami, Jamiet-e-Ulaima Hind and Muslim legislators and municipal councilors had appealed that the community not follow the call of bandh. 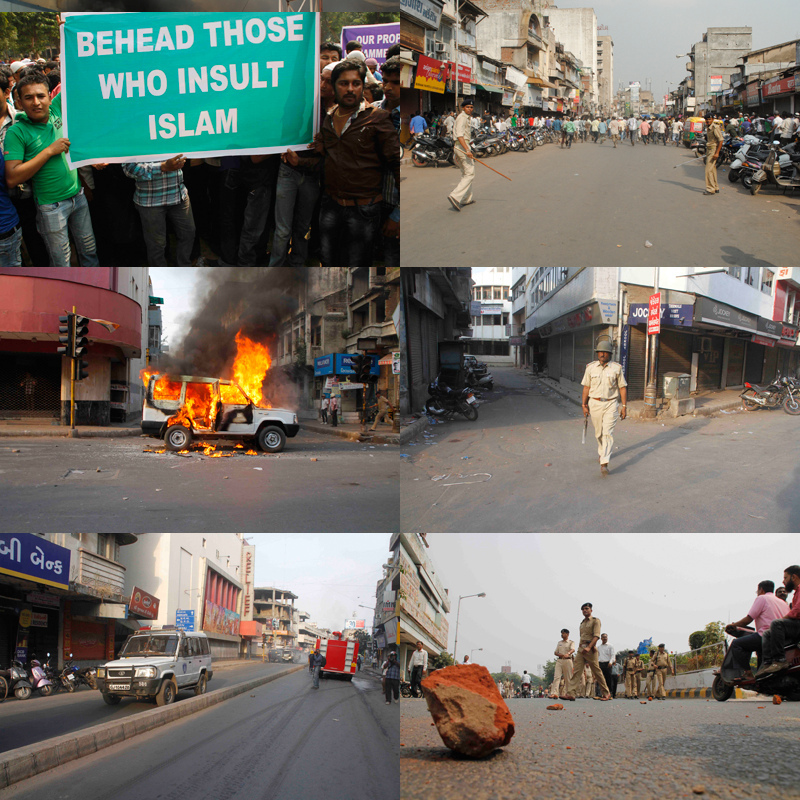 At first Jihadi elements clashed with Jumma Masjid Imam’s followers and later they took into the streets of Ahmedabad. Jihadis torched a Police station. Jihadis locked women officers inside police station near Tran Darwaja and set the police station to fire. They also burnt the Khas bazar chowki. Many vehicles parked outside police post were also torched. Senior cops - joint commissioner of police Ajay Tomar and deputy commissioner of police Himanshu Shukla along with assistant commissioner of police Nirlipt Rai with 1,000 police jawans rushed to the spot.Immediately afterwards the city cops started a combing operation to hunt down those responsible for the violence.When the police were busy in crowd control near Teen Darwaja, another group of violent protestors attacked a government vehicle near Relief Cinema and set it ablaze.